At 5896m, snow capped Mt. Kilimanjaro, known as the ceiling of Africa, has the highest peak in Africa. It is one of the continent’s most magnificent sights. 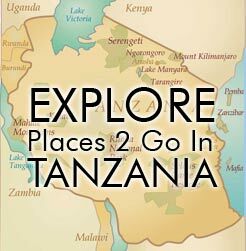 It rises through lush rainforest, alpine meadows and barren lunar landscape to the twin summits of Kibo and Mawenzi. For most of the trekkers the goal is always to reach Uhuru peak, Kibo’s highest point. A person of average health and strong determination can reach the summit without ropes or technical climbing experience. 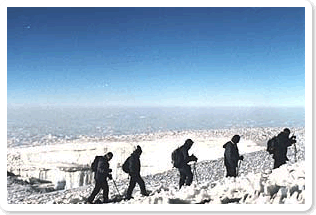 It usually takes five days (four nights) to climb to the summit and down through Marangu route, the most popular route. On the Marangu route, campers sleep in huts while they sleep in tents on all other routes. Other routes take a little longer but are often less-traveled and have more interesting scenery. The Machame route has a gradual ascent before approaching the summit via the top section of the Mweka route, while the Umbwe route is much steeper and a more direct way to the summit. Its upper section, which is often covered with snow and ice, is a serious undertaking. A mountain guide accompanied by a cook and porters who carry the food, camping equipment and other supplies lead each climb. Our operation follows KPAP certification guidelines and is overseen by Access 2 Tanzania’s Climb Coordinator, Hamisi “Big” Musa. Treks in April, May and November qualify for a $50 pp discount. The above tipping guidelines are per group sharing.